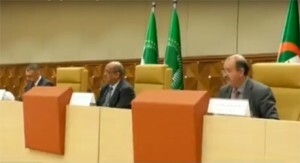 Algiers 9 April 2018, The African Union Commission and the People Democratic Republic of Algeria have jointly convened, in Algiers, a two-day meeting on “Combating Terrorist Financing in Africa”. This meeting is organized in pursuance of the Communique of the 455th Meeting of the AU Peace and Security Council (PSC) held in Nairobi, Kenya on 2 September 2014, at the level of Heads of States and Governments. The High Level Meeting was officially opened by His Excellency Abdelkader MESSAHEL, Minister of Foreign Affairs of Algeria. A statement was also delivered by Mr. Idriss Mounir LALLALI, Deputy-Director of the African Centre for the Study and Research on Terrorism (ACSRT), on behalf of the AU Commission. The meeting is attended by senior officials from government and institutions in charge of combating terrorism, and more particularly, those combating terrorist financing, from African Union member states, as well as representatives of relevant United Nations agencies, the European Union and other international and regional organizations and institutions in charge of countering and preventing terrorism and terrorist financing. The main objectives of the meeting are to identify the current and evolving modus operandi, and channels used by terrorists to collect, generate and move funds, identify and assess the effectiveness of international, regional and national instruments (cash management and control of resources and payment levels) open to African countries for combating terrorism financing, promote enhanced cooperation and collaboration between national, regional and international stakeholders, as well as to promote transparency and good governance, foster increases and greater operational mobilization and contribution from financial actors in combating terrorist financing, propose aspects of the African strategy to combat terrorist financing and strengthen the existing African framework for combating terrorist financing. This meeting is an opportunity to take stock of the progress made, begin to examine the lessons learnt and the required improvements bilaterally, regionally and multilaterally, which shall pave the way to a more robust, comprehensive, and better coordinated and action oriented approach in order to reverse the worrying trajectory of the threat. In this regard, the meeting seeks to offer a platform for the sharing between the participating member states of practices, as well as measures, laws and policies implemented to respond to terrorist financing. in additional it seeks to highlight the important role of national Financial Intelligence Units (FIUs) as well as collaboration and information sharing on Terrorism and its Financing.